Well I've been waiting for 3 days for just one drop of sunshine to come into my house so I could photograph my mantel. I've settled my mind around the fact that this might not happen until after Christmas - so I'm making do with funky lighting and PicMonkey. This will probably be one of those posts that I look at 3 years from now and say "I can't believe I put those pictures on my blog" and "look how much my photography has improved!" 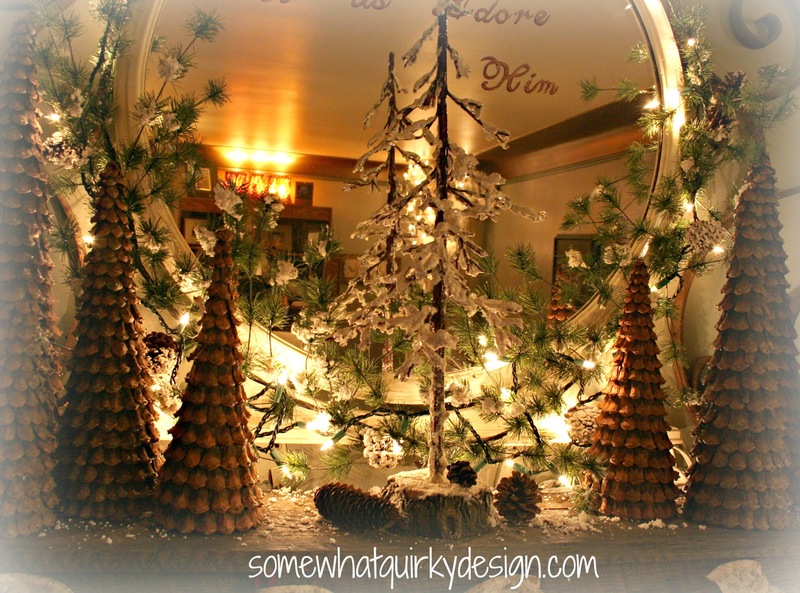 When I made my last post about the pine cone trees, I wasn't sure that I was going to leave them on the mantel. I had another vision for my mantel and wasn't ready to let it go. But alas, after living with it for a few days it grew on me. I put the other vision on hold, hung the stockings with care and added a glitter graphic to the mirror. This is one of two vignettes that I have completed. You probably know that means that the rest of the house is filled with boxes and half completed decorations. You probably also know how difficult it is to get pictures that don't capture a box, a stack, or an outright mess. And just when you think you have it you look at the picture and the mirror is reflecting one of the stacks of boxes, or trash, or furniture piled up together . . I love these handmade stockings. I bought the patterns when my kids were very young - during my cross stitch phase. When they were a tad bit older and still unfinished, my mother cross stitched them for me. 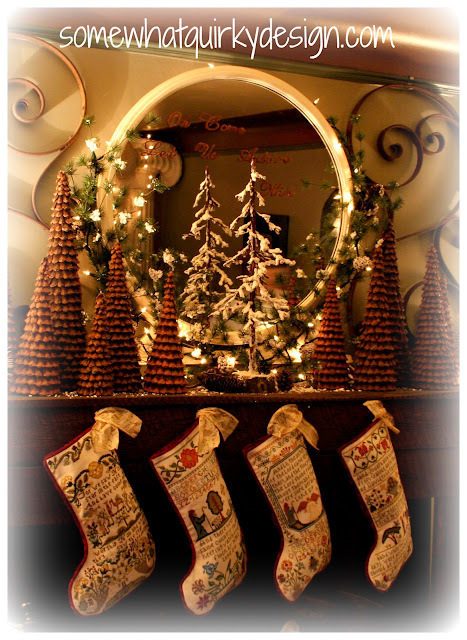 Then a couple of years later I put the stockings together. They function as a nativity scene as well. A note or two about the graphic. First, I wish I had made it bigger. Second, I need a Silhouette. 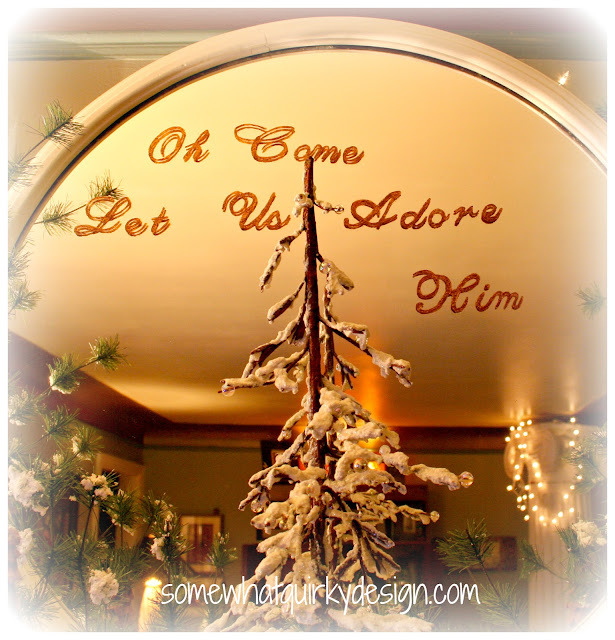 I read on someone's blog - someone who had done a graphic on their mirror - that Martha Stewart Glitter Acrylic Craft Paint would work for this. This paint is pretty transparent except for the glitter (I used bronze) so it didn't actually do the job. It did provide a good primer for a bronze paint that I used to make it visible. Then I used another coat of the glitter to make it more sparkly. I really like this glitter paint. It gives a gentle sparkle to whatever you put it on. I tried it on some pine cones and it is perfect. 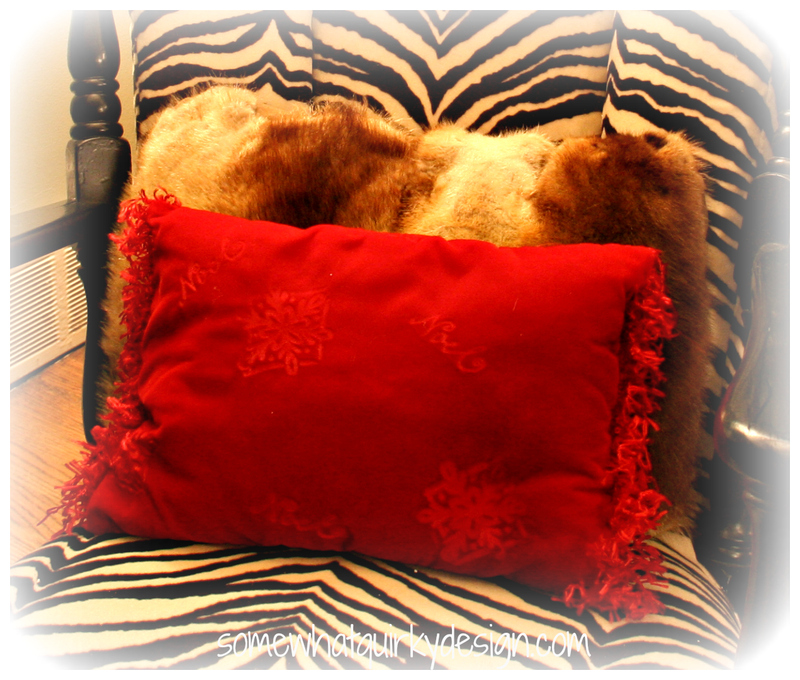 I made this pillow with some polyester velvet, rubber stamps and an iron. I love this technique, but it takes patience and a delicate touch. I haven't had a chance to check out many mantels yet this year. I would love to see yours so send me a link! I think I'm going to spend this Saturday sitting on the couch with my laptop and the Hallmark channel stalking everyone's Christmas decorations! I did a graphic on my mirror with a Sharpie. If you did that underneath the glitter paint, I bet that would make it more bold! The lighting just looks cozy...like it's from a fireplace...seems perfect to me! Love the mantle! Found it from The Lettered Cottage Linky party. Ahhh I can smell the cinnamon and pine!! i just wanna curl up with a book right there! 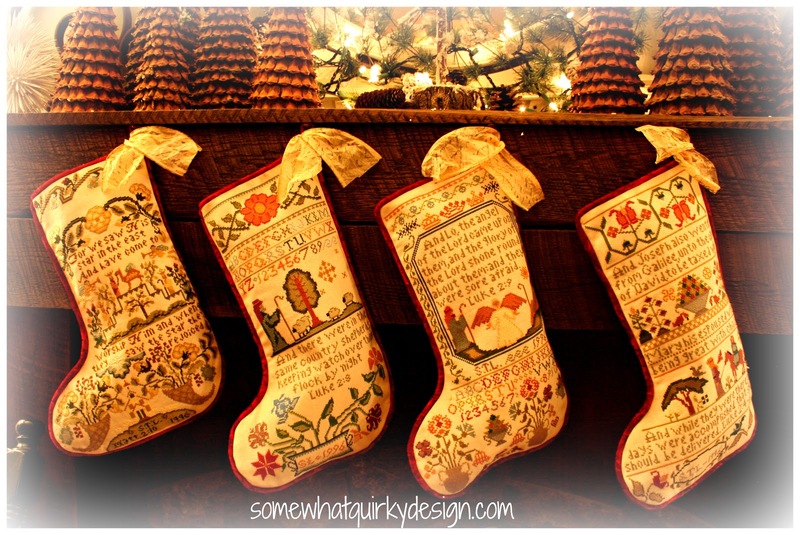 love the rustic and natural elements, and the stockings are so special. Your mantle looks great - those trees are amazing and your photography gives the whole thing a cosy, warm feeling - I don't think you should have worried about waiting for sunshine! Karen, everything you've done so far looks terrific to me. The lighting is like a campfire and perfect for the holidays, and that technique on the mirror is very interesting. I do like that glitter idea. Happy holidays. Thanks for stopping by--I had to return the favor. Love it that we live close by (sort of) and LOVE those corbels by your fireplace. This looks great! 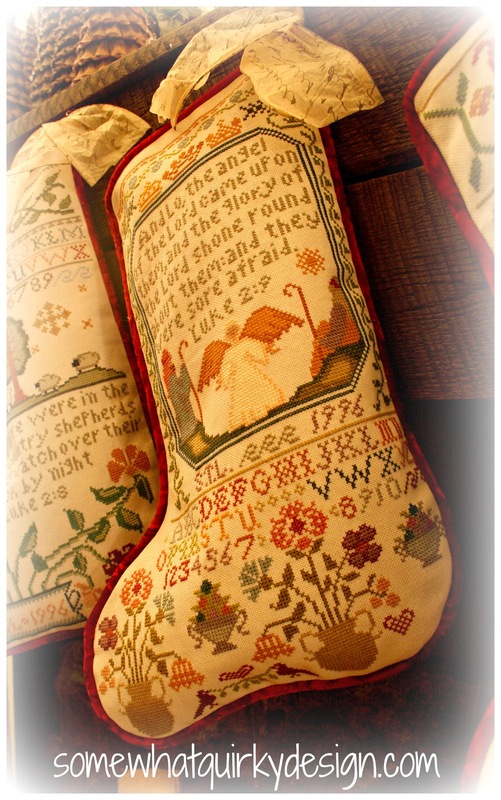 I love your handmade stockings. 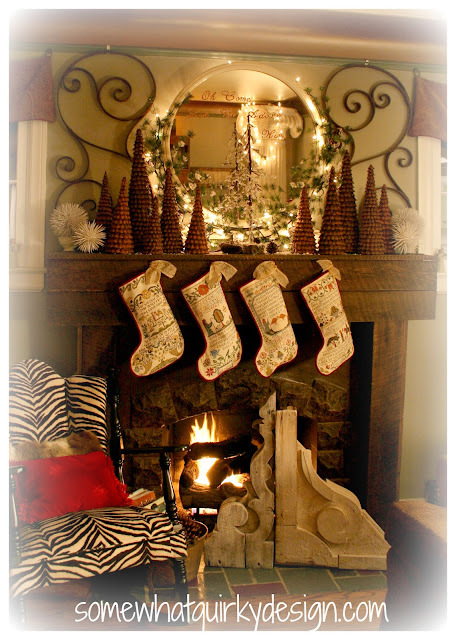 Your mantel looks perfect and cozy. I love the script on the mirror. Nancy over at Sea Rose Cottage just did this with gilding wax and it came out perfectly. Thank you so much for sharing it over at our Home for the Holidays link party. Very pretty! And your chair is amazing! Love it all!